The majority of German emigrants went to the USA (where German settlement had started as long ago as the 1620s). It was a much quicker and cheaper journey. When people's wages were only about £1-2 per year, it cost about £6 to sail to the USA but about £15 to get to Australia. 80-90% of German emigrants went to the USA, nevertheless Australia was the destination of a significant number of the remainder. 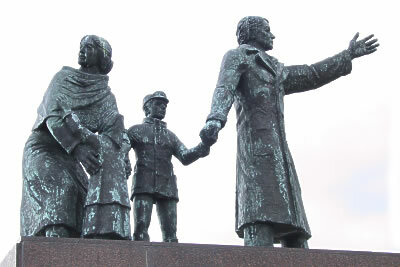 Photo at left: memorial "The Emigrants", on the dyke of the River Weser at Bremerhaven. Very many emigrants sailed from Germany via the port of Bremerhaven. In his book A History of Germans in Australia 1839-1945 Charles Meyer lists four basic reasons for German emigration: religion, the economic situation, political motives, and social motives. These four main reasons were not all significant factors at the same time, nor can they be seen as working independently of each other (often at least two of the reasons drove an emigrant's, or emigrant group's, decision to emigrate), and nor were they equally important in terms of the numbers of emigrants involved. People's reasons for emigrating are also complicated by the factor that often both "push" and "pull" factors played a role. Examples of "push" factors (circumstances that made people want to leave Europe) were: failed crops, rising prices and the desire to avoid compulsory military service. Examples of "pull" factors (attractions in Australia) were: shortage of workers, cheap (and sometimes free) land, and the lure of the gold rushes. Many Germans who felt that government policies stopped them from worshipping in their own way left their homeland. In the 17th and 18th centuries many Germans left for England, Russia and the USA as a result of religious persecution, and this continued into the early part of the 19th century. Many governments in the German states and kingdoms saw political dangers for themselves when leaders of some religious sects told their followers not to fight for their ruler and not to pay taxes which could be used to finance wars. So sects in German-speaking Europe such as the Mennonites, Herrnhüter, Pietists, Baptists and German Quakers often were confronted with government laws that demanded that they join the State religion. The best-known example in German-Australian history is the migration of "Old Lutherans" from the Prussian provinces of Silesia, Brandenburg and Posen to South Australia in the late 1830s. They were opposed to King Friedrich Wilhelm III's enforced union of the Calvinist church with the Lutheran church to form a new state church. They disagreed with the new prayer book. Communities who stuck to the "Old" ways were persecuted; some pastors had to hide from the police and held church services secretly at night in the forests. Some pastors were imprisoned, some communities' property was confiscated. This religiously motivated immigration always involved group immigration, with the pastor leading his people, and with their common belief uniting them against problems they encountered on the journey and at their destination. However, after the early 1840s (particularly after the death of King Friedrich Wilhelm III) religious persecution in Germany was no longer the leading reason for emigration to Australia. It is generally thought that religious reasons would not have been all that motivated Germans to leave their homeland; the economic situation they found themselves in would have been a serious factor in their decision. When the Napoleonic Wars ended in 1815, war-time markets for certain products collapsed too, and competition from cheaper British products grew as they were allowed into Europe again. Masses of soldiers released from German armies went back to their farming areas and soon there was not enough viable farming land and work to go around, especially in Prussia and south-west Germany. Prices started to rise but wages didn't - across Germany generally wages stayed constant between 1820 and 1850, but there was a 50% rise in the prices of basic items like rye, potatoes and clothing. After 1865 (which happened to be the end of the American Civil War and the start of free land grants in the frontier parts of the USA) the number of people leaving Germany increased considerably, and some of them were attracted to Australia. The years during which Prussia fought wars against Denmark, Austria and France (1864-1871), and the uncertain situation which continued for a couple of years afterwards saw many Germans leave Europe. Once peace settled down emigration numbers dropped (1874's emigrants numbered less than half the 1873 number). In the 1870s cheap products from the overseas colonies of European countries and from the USA began to change European markets. Prices for agricultural products and raw materials dropped, and land which used to be viable became worthless and unemployment and personal debt rose. The newly united Germany (unification as the second Reich 1871) changed from being a basically agricultural nation to being an industrial one. New technologies meant that wealthy people invested their money now in industry rather than in unprofitable farming businesses. This of course left some small farmers with no choice but emigration. In the aftermath of World War Two when Germany lay in ruins many refugees and homeless people took the opportunity to start a new life in Australia under the big immigration programs started in the late 1940s by the Australian Government. Germans leaving Europe in order to avoid compulsory military service in the army can be considered to have emigrated for political reasons. The failed revolutions of 1848 were for some people the final impetus to go overseas. In that year, middle-class people in the German states started an unsuccessful revolution. They wanted to create a united German nation with an emperor, but they also wanted to introduce democracy and have an elected government that would be responsible to a parliament. Some Germans who had a high profile in the events of the unsuccessful revolution were worried about their future, and emigrated. Some came to Australia in the search for a freer society, however, the number of "48ers" motivated purely by politics would have been small. Economic conditions in Germany would have played a part in their decision, and the failed revolution of 1848 would have sealed the decision for them. Emigrants motivated by the lack of political change were city people, however, the majority of German emigrants were small farmers, rural labourers and tradespeople - they weren't concerned with what was happening in the cities, they were concerned with issues in their village and with crops and soil. In the late 1930s many Germans and Austrians fled from Germany in order to escape Hitler's persecution of artists, intellectuals and Jews; many came to Australia. The unhappy journey of the passengers on the ship Dunera, on which the British Government expelled many refugees from Germany and Austria who were opposed to Hitler, brought people to Australia who stayed after the war and made valuable contributions to Australian society. Another reason for emigration was when a person's social status changed downwards as a result of social or economic changes, and when they could not come to terms with this change in their position. This could be a change from land-owning farmer to wage labourer (perhaps as a result of small farms becoming unviable, as happened in regions such as south-west Germany, where upon a father's death his land was split up equally amongst his children), or perhaps from being an independent tradesman to being a factory worker through Germany's industrialisation from the 1870s onwards. These people might have seen new horizons for themselves in a place like Australia. Emigrants motivated by social reasons included those who were somewhat "speculative" in their actions; they weren't badly off at home in the German-speaking countries, yet they were curious to see if they could do better in another country like Australia - an element of adventure. This includes of course the thousands of Germans who flocked to Australia's (and particularly Victoria's) gold rushes in the second half of the 19th century. Some Germans coming to Australia from the late 1950s onwards would have had similar motivations; the West German economy was starting to boom after recovering from World War II, yet there were people who saw excitement in a new life in Australia, where the economy was also in a healthy state. During the 1970s and 1980s, although the Australian economy was not doing too well, there was great interest in West Germany in emigration to Australia. Emigrants described their feelings as: dissatisfaction with life in densely populated, hectic Germany; cleaner environment/nature; perception of greater safety in Australia in the event of a nuclear conflict in Europe. For many immigrants better weather was and still is an important reason! This German fascination in the 1980s with the idea of emigrating to Australia is reflected in the song "Australien" on the 1986 album "Weibsbilder" by the singer/songwriter Pe Werner. The song is about a young woman who wants to escape from her problems in Germany and dreams of emigrating to Australia. You can read the song lyrics here (in German). Some German immigrants feel that life in Australia is more relaxed and less rule-governed than in Germany (see photos). Meyer, Charles. 1990. A History of Germans in Australia 1839-1945. Monash University, Clayton (Victoria). Ortlepp, Gunar. 1982. "Kontinent der Träume", SPIEGEL 18/1982, p 170 ff. & SPIEGEL 19/1982, p 174 ff.